Railpictures.ca - Nick Batten Photo: A couple of years ago, intermodal trains on the New Westminster Sub would have seemed out of place, but with CN stepping up use of their Burrard Inlet Line to access Port Metro Vancouver, stacks now make up the bulk of traffic on any given afternoon. This stretch of track is steadily getting busier and vusier, with a new grain elevator in North Vancouver that would see an increase in daily train traffic nearing completion. | Railpictures.ca – Canadian Railway Photography – photographie ferroviaire Canadienne. Copyright Notice: This image ©Nick Batten all rights reserved. 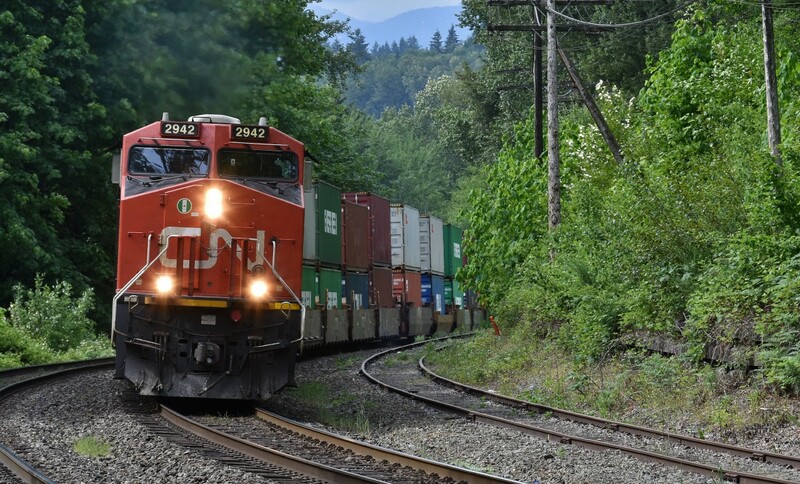 Caption: A couple of years ago, intermodal trains on the New Westminster Sub would have seemed out of place, but with CN stepping up use of their Burrard Inlet Line to access Port Metro Vancouver, stacks now make up the bulk of traffic on any given afternoon. This stretch of track is steadily getting busier and vusier, with a new grain elevator in North Vancouver that would see an increase in daily train traffic nearing completion.